The Chris Reeve Ti-Lock was introduced in 2010, as a collaboration between Grant and Gavin Hawk and Chris Reeve. This knife went on to win the Blade Show 2010 Overall Knife of the Year and really highlighs both the G&G Hawk as well as CRK heritage in its design. 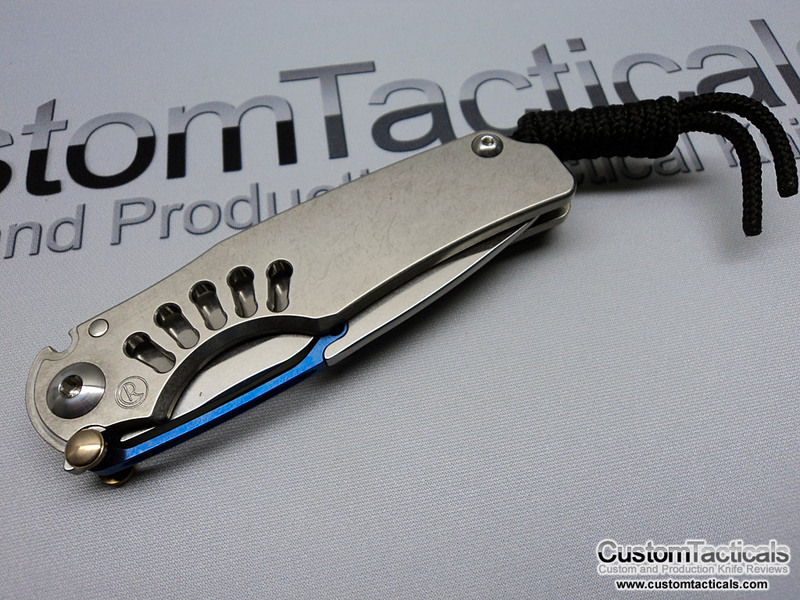 The first thing that you notice when you pick up the Ti-Lock is the blue annodized Titanium bar that is set into the blade spine. This blue bar serves as the locking mechanism as well as the opening device as there is no thumbstud on the Ti-Lock. While its a bit tough getting used to initially, I think you could probably get quite accustomed to it with some use. I’ll run over some of the features that I liked and disliked here. 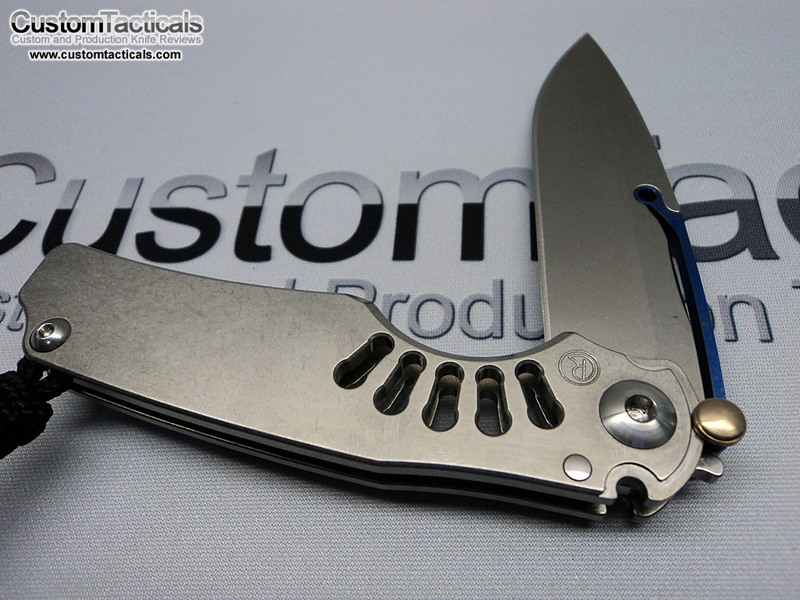 The blade is 3.25″ long, and features CPM S35VN stainless steel, hardened to 58-59HRC, which is harder than CRK was willing to heat treat S30V to due to brittleness. Most buyers will appreciate this increase in rockwell hardness. 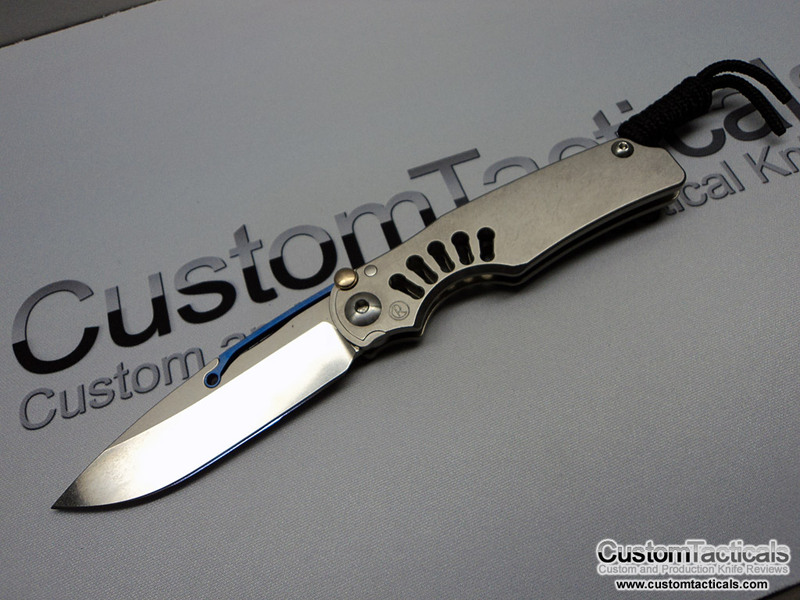 The blade is a drop point style, and generally very characteristic of a CRK blade: General utility-style shape, Hollow Grind, Stonewashed finish. 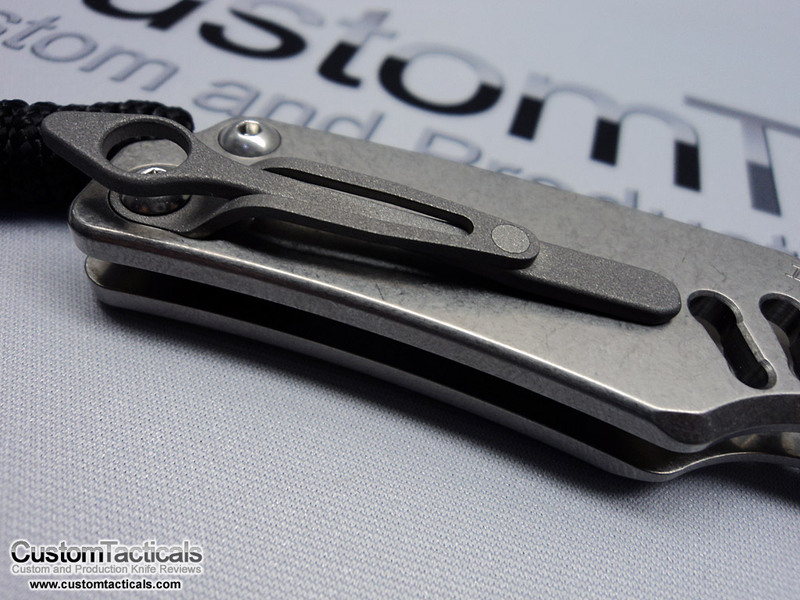 The handle on this Ti-Lock is 6Al4V Titanium, which is pretty standard on all CRK folders. 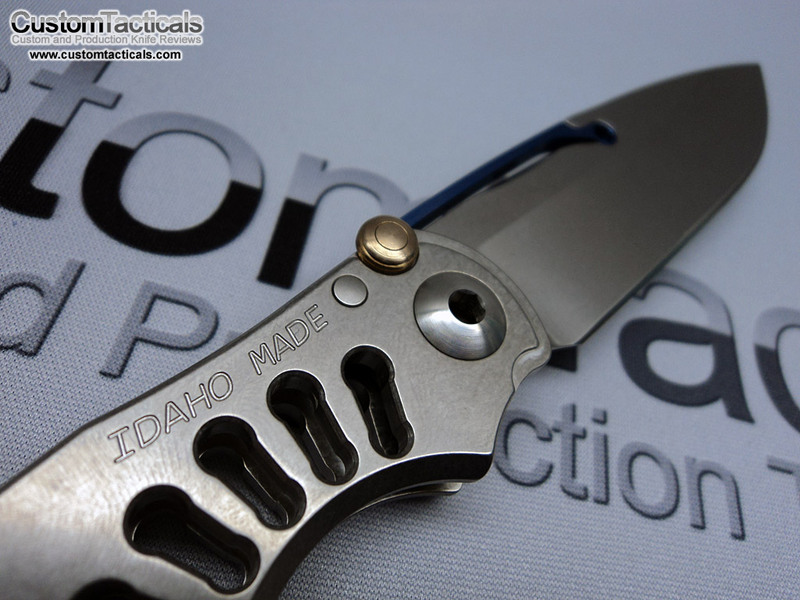 The handle measures just shy of 4″ in length, which is quite an efficient length given the 3.25″ blade. This is partially due to the forward location of the Pivot, allowing more room for the Blade. The ergonomics on the handle are very good, and the cut outs near the finger choil offer some grip as well. 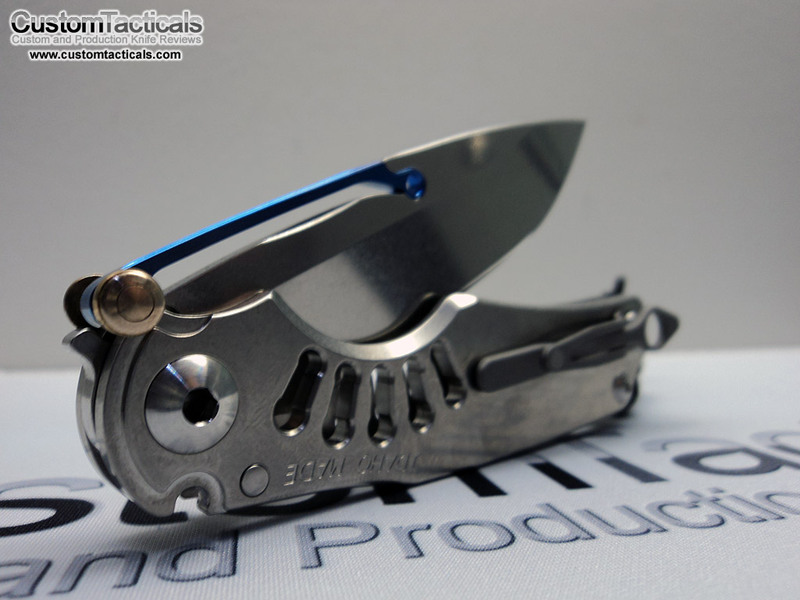 As opposed to most CRK folder handles, he has chosen to go with Stonewash as the handle finish instead of the usual bead blast that CRK is known for. This is a nice slightly more upscale looking finish that I think offers a bit more resistance from wear marks. CRK’s bead blast finish is notorious for showing wear spots very easily. The Ti-Lock is a locking mechanism invented by Grant and Gavin Hawk, creators of some of the most unique folding locking systems on the plante. While not all of them are practical or even desirable to many, there is no doubt that they are creative and well executed. The Ti-Lock falls into the practical category of locking systems, at least as practical as they get from G&G Hawk. The lock works by using spring tension to hold a “barbell” against the curvature of the front of the handles. This barbell fits into notches designed into the knife handles in order to Lock the blade open as well as work as a detent to hold the blade in when closed. It rolls along the handle when the knife is actuated almost like a reverse axis-lock. Superb fit & finish, typical of Chris Reeve Knives. The tolerances are perfect, with absolutely no play in and way, shape or form. While I wouldn’t mind seeing some polished finishes and some more “difficult” machine work by CRK, this is as good as it gets with this level of finish. At least we are getting some Stonewash finish now over the bead blasting. CRK does do some satin finished handles on the graphic Sebenzas, so I wouldn’t mind seeing a Satin Finished Ti-Lock handle with a fully polished blade. Now that would be a stunner! Either way, this knife is finished very well and the fit is second to none. Good job CRK!